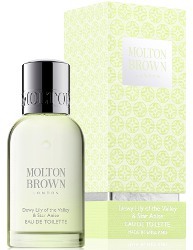 Molton Brown has launched Dewy Lily of the Valley & Star Anise, a new floral fragrance for women. Inspired by the elegance of a white blossom bouquet, Dewy Lily of the Valley & Star Anise honours the delicate flower. [...] A fresh eau de toilette combining the floral notes of lily of the valley, magnolia and peony, finished with notes of ylang-ylang, sandalwood and white musk. Additional notes include star anise, green mandarin and white tea. Molton Brown Dewy Lily of the Valley & Star Anise is available in 50 ml Eau de Toilette and in matching bath, body and home fragrance products. With Molton Brown, I end up thinking of luxe shower gels and handwashes. Have you any Molton Brown perfumes? Not a one. I want to try the Tobacco Absolute if I ever run across it. From what I’ve read, their staying power isn’t very good. But I do really like some of their bath and body products, especially the Orange & Bergamot, Ylang Ylang and Patchouli & Saffron, which reminds me a lot of the original Agent Provocateur. Agree about the staying power. They are mostly (to me) sort of Jo-Malone-ish: simple, materials-based, lightweight. I do like the note combination in this. Not an easy brand to locate, however. Molton Brown actually has a branch in my perfume-forsaken bit of the UK – may have a look for this next time I’m in the city centre – sounds interesting (I’ve worn Penhaligon’s Lily of the Valley in the past).